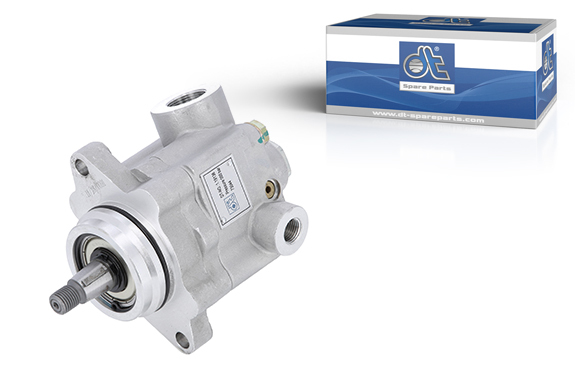 The 1.19136 power steering pump generates the hydraulic oil required for easy steering of the vehicle and supplies it to the steering gear. A blowhole-free aluminium housing manufactured by the high-pressure process contains a rotor with rotor blades manufactured to the highest precision, with the best possible surface roughness and extreme hardening, in order to withstand even the most extreme operating conditions in winter due to temperature fluctuations and salt. A durable, oil-tight pump is guaranteed by the use of a high-quality shaft seal ring. Each pump is individually checked for the manufacturer‘s specifications during production. The equipment must be checked before the article is replaced. If a high water content or dirt particles are detected, the equipment must be replaced. In case of heavy soiling, the hydraulic system should be rinsed as described in the assembly instructions supplied with the article. The mounting surface must be cleaned. If sealant is used during assembly, it is important that no sealant enters the operating fluid circuit. The erection screws must be mounted with the torque specified by the manufacturer. The connections should be installed by hand to prevent damage to the thread. Now ventilate the system: The steering wheel must be turned three times to the left and three times to the right when the front axle is raised. During the subsequent test run, the leakage check must be carried out and the level of the equipment must be corrected.